You wouldn’t normally expect to find solar panels on the rooftop of a church. But in 2015, a year in which solar power capacity is being added at a faster clip than all other power sources combined, that is where we are. 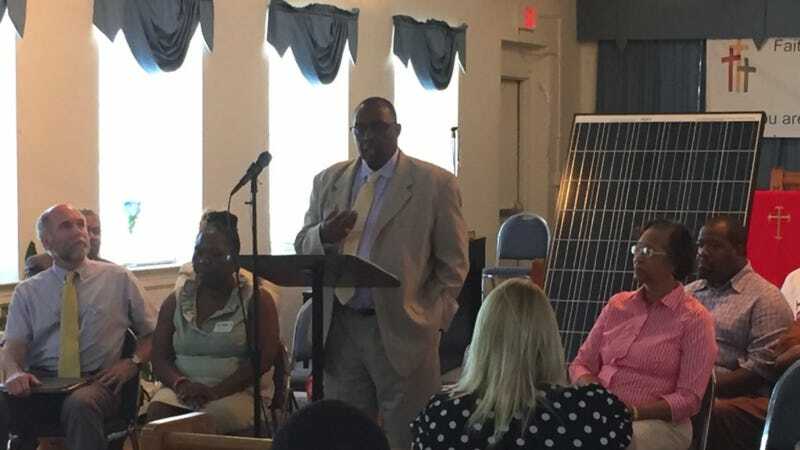 Earlier this year the Faith Community Church in Greensboro, N.C. partnered with local sustainability nonprofit NC WARN to install 5.2 kilowatts-worth of electricity. But the collaboration was technically illegal: North Carolina is one of three states where it is against the law to have a “third-party” — that is, non-utility — supplying power. Now, the church — along with the rest of America’s burgeoning solar supplier industry — finds itself at odds with America’s largest utility, Duke Energy, who is aggressively lobbying against a bill that would let the church install its panels. Last year, North Carolina installed the second-greatest amount of solar power of any state in the U.S. — trailing only California, and beating Arizona — thanks to an array of cleantech incentive policies and one of the most aggressive renewable portfolio standards in the country. Still, North Carolina remains one of four states (along with Florida, Kentucky and Oklahoma) that have laws explicitly banning third-party ownership of solar panels. Having third-party ownership allows homeowners to pay for an otherwise costly rooftop solar electricity system in installments, either through a lease or a loan. Third-party developers like SolarCity have been most responsible for America’s solar boom. But as many have written, these kinds of companies represent a threat to large utilities like Duke, which have enjoyed near-monopoly status for decades. Now, North Carolina state legislators, led by Republicans, have introduced the Energy Freedom Act, which would allow third-party leasing of rooftop solar systems. "Free enterprise, in the form of market competition, is the cornerstone of the success of the United States and our economy," Republican Rep. John Szoka said upon introducing the bill. "Allowing North Carolinians to generate electricity on private property and allowing consumers flexible financing options, has immediate and long-term benefits that extend beyond the parties involved in third-party agreements." Duke has been aggressively lobbying against the bill — and at one point attempted to enlist Rev. Johnson himself to help. In other states where debates about increasing the cost of solar have come up, large energy companies have attempted to enlist African-American groups to argue that expanding solar access only benefits the wealthy and causes lower-income residents’ electric bills to increase. Complicating the picture further is the looming expiration of federal solar tax incentives in 2016. As a result, solar stakeholders hope to push the North Carolina bill through as soon as possible. “If we stop talking until year and the tax credit expires, most of these companies will have moved on,” said Ivan Urlaub, executive director of the NC Sustainable Energy Association. Sensing the heat, Warren believes, Duke quickly swung into gear and got the church’s system up and running in a matter of a couple of weeks. Duke spokesman Randy Wheeless said that what NC Warn was trying to do was, and remains, illegal. While Duke was willing to assist the church, it is fighting WARN’s efforts to ask the state utility commission to officially sanction the project. “They don’t want to have to follow the rules of being a utility,” Wheeless said. Should the commission refuse, Warren has said they will bring the case to court. The bill remains in play for this legislative session, and its fate could have repercussions in states like Florida, which is currently debating a third-party ownership amendment — and Wisconsin, where solar regulation remains contested. The campaign to enlist African American groups to fight off expanding solar markets has recently gone national. The L.A. Times’ Evan Halper reports that the National Black Caucus of State Legislators and a group representing the Congressional Black Caucus, as well as some 10,000 black lawmakers in all levels of government, have backed proposals are almost identical to bills favored by big energy companies. "We want solar available for everybody, not just people who are wealthy," said Joe Gibbons, a former Florida lawmaker, told Halper. Rev. Johnson sees this as hypocritical. The Energy Freedom Act, he says, would reduce the cost of solar to churches and homes, open up possibilities for of small businesses, help the environment, and reduce the monopoly held by the energy industry in the south. “It would have a lot meaning, and even more meaning to African Americans who may not have the ability to pay up front,” he said.